President Trump loves railing against the trade deficit even as it reaches a 10-year high. But here’s the thing. Countries with large surpluses have to do something with all that cash, and there’s only so many domestic investments available. Instead, much of that money finds its way into foreign direct investment (FDI). And it turns out, the U.S. receives over $275B, by far the most FDI of any country in the world. That’s according to a new set of numbers released by the United Nations for 2017, the latest year for which complete figures are available. Foreign direct investments (FDIs) occur when one company or person buys an ownership stake in another company located in a different country. 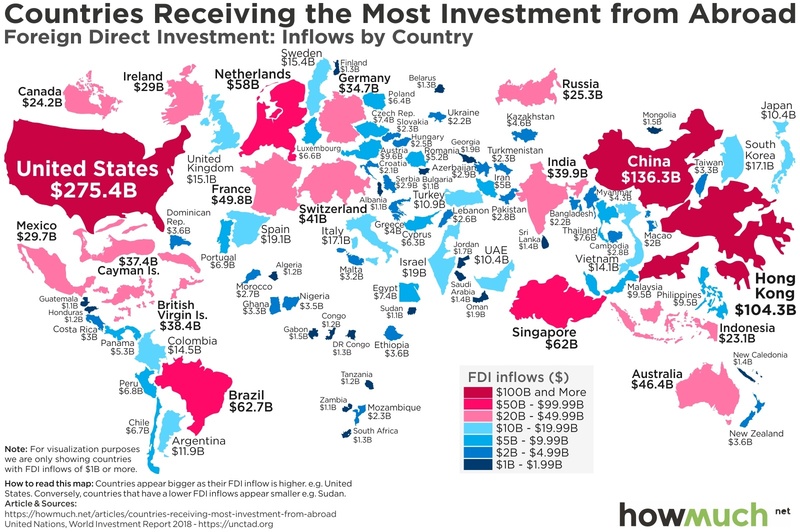 We created a color-coded map corresponding to the level of FDI inflows each country received in 2017, excluding countries with less than $1B. We then adjusted the size to also indicate the level of investment, creating a unique world geography of capital flows. To start, the U.S. ($275.4B) and China ($136.3B) are clearly the two biggest beneficiaries. We technically separated Hong Kong ($104.3B) from China in the list above, and even still China passed the $100B mark. Things get more interesting the further down the list you look. Brazil is the only country in Latin America to crack $50B, and it’s followed closely by the small city-state of Singapore ($62B). And then there are a smattering of Western European countries pulling in tens of billions of FDI, led by the Netherlands ($58B). India rounds out the top 10 ($39.9B) as a developing country with billions of people but less than $40B in FDI. The most interesting thing about our map is how it distinguishes between rich, developing and poor countries. We excluded for visualization purposes any country seeing less than $1B in FDI, and as a result almost the entire continent of Africa disappeared. Eastern Europe and the Middle East both likewise seem tiny as they’re sandwiched between rich nations in the West and developing ones in the East. Most of South and Central America similarly pale in comparison to Brazil and North America. Special mention should be made of the British Virgin Islands ($38.4B), where clearly lots of overseas capital is looking for opportunities in a warmer climate. It’s worth pointing out that Trump’s policies have decreased FDI to the U.S. even if he’s recently changed his mind about severe restrictions. There are legitimate national security concerns for allowing companies with close ties to foreign governments to invest in companies with key U.S. military technologies. That being said, FDI is generally seen as a great thing because it’s directly responsible for some 12 million U.S. jobs. Who wouldn’t want billions of dollars of foreign capital spent on job creation?